This sampler is so much fun to stitch. I have a little bit more stitched now and will share another picture soon. I asked Katrina for her permission to copy her idea of using the alphabet on the bottom instead of the words "Christmas Garden." 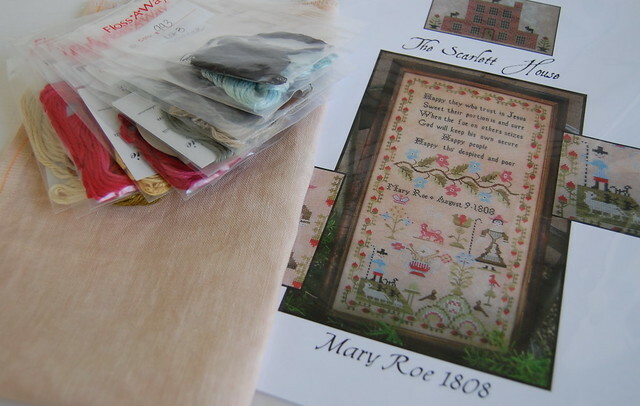 Another sampler I really want to start is "Mary Roe 1808" by The Scarlett House. Check out Margaret's beautiful finish!! 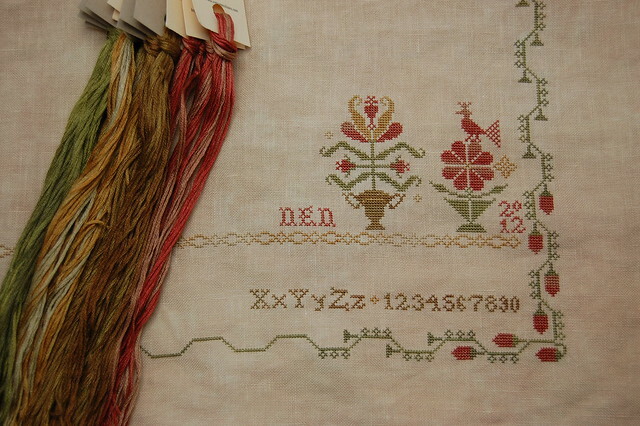 I was thinking of using the same linen for Mary Roe that I'm using for Christmas Garden - 40 ct. Vintage Lt. Examplar. It's a beautiful dye-lot. Oh, two beautiful pieces that I want to stitch too! You're off to a great start with Christmas Garden. and congratulations on finishing Ann Grant! She's a beauty! So happy to see you yesterday. They look darker in your photos, but I do still love them (posting about it now). Beautiful start, Nicole! I finally finished mine and made a slight change. What a fun stitch this (finally) was! Nice start on Christmas Garden... the colors look good to me. I think Mary Roe will look great on the Vintage Light Examplar too. I've got BBD's Christmas Garden in my stash as well. I am going to be pulling it out this year too and stitching it up. It's gorgeous! I'm with you on the colors. Although they have grown on me, I was not sure I liked them, or if I could like them enough to continue working on the sampler. I tried changing colors, but none of them looked right, and after that, the original colors looked better to me. Your CG looks beautiful already! I'd love to start Mary Roe as well after seeing Margaret's. And now you are just about starting her. How tempting! Christmas Garden is on my stitching table calling my name. I wan't so fond of the floss either...but I've seen it stitched up and it's lovely. I'll enjoy watching yours come to life. I have Mary Roe on order. I LOVE THE COLORS...that Margaret is such an enabler isn't she? Although I don't need much urging to spend $$$ on stitch. I love Christmas Garden! That fabric will look great for Mary Roe as well. I just saw Margaret's finish a few minutes ago. I love your Christmas Garden - the colours are so lovely. I love Mary Roe too! Your Christmas Garden is wonderful!!! Ok, now I want to start that one too. lol! You'll enjoy Mary Roe -- she's so much fun! Had fun stitching with you yesterday! As always, your piece is looking good! Those colors look nothing like themselves once stitched, do they? I love it now that you are going with things....And, of course, I want to stitch Margeret Roe too... Saving up for that one! I know you ladies had fun yesterday at the FH...Wish I could have come.... Please let me know when the next one has been scheduled for....Maybe Linda and I can make that one! I see the Mary Roe fever has spread! My Miss Grant is catching up to yours and I really love those colors in the Christmas Garden, and I think the idea of different wording is great so you can use it all year. I have seen Margaret's Mary roe and i want to stitch her to! Lovely start - the colours are perfect :) I admit I like the idea of the alphabet at the bottom too! Your Christmas Garden is already looking gorgeous! Katrina's alphabet idea works so well with this one. Mary Roe will look wonderful on the fabric too. Beautiful!! Love your new start--I want to stitch that AND Mary Roe!! Then I go and sit down and do absolutely nada. I need to snap out of it. I always love seeing your pics--they're a nice kick in the pants to get going--so inspirational! Beautful! Enjoy stitching this one. I think the colors on BBD Christmas Garden are beautiful...they are definitely my color palette. Your stitching looks lovely as always. 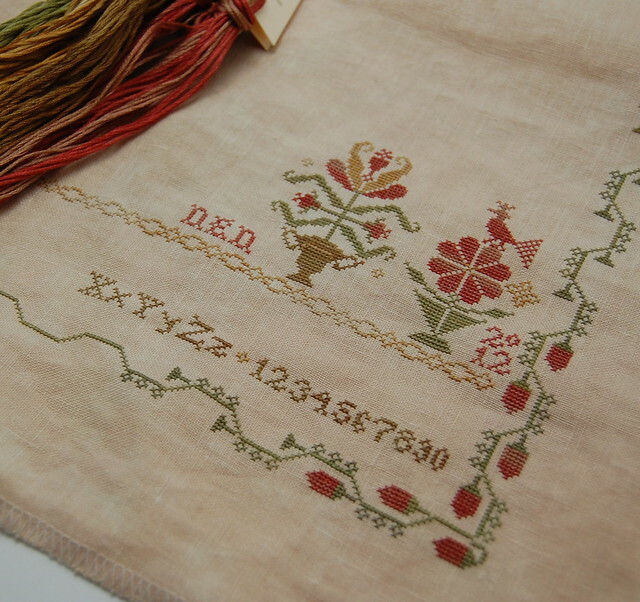 Enjoy the project...the motifs on this one are just so charming! I'm wanting to stitch Mary Roe also! Well, after I buy her that is. My question - are their DMC conversions in the chart? Very pretty and so is Mary Roe! Christmas Garden is beautiful and I agree with your choice of fabric, that is a lovely dye lot. You're off to a fantastic start on Christmas Garden! It looks great. And isn't Mary Roe the best. That is definitely one for my stash list soon. Can't wait to see your start! Beautiful new start and such wonderful new stash too! I love the fabric you chose for Christmas Garden, Nicole. I think it looks beautiful and the colors are perfect on it. I am still thinking about what to do instead of the Christmas garden saying. I love Mary Roe too and I am also looking forward to starting mine. Pretty, pretty!!!! It took me a bit to love the colors too. Great progress on Christmas Garden! I just love the colors and the change over to an alphabet. Isn't Mary Roe wonderful! I am debating that chart buy after seeing Margaret's finish! Beautiful stitching as always! Are my eyes deceiving me or is the border to Blackbird's Christmas Garden and Mary Roe 1808 by The Scarlett House almost identical? A lovely start to your project. Hey, Nicole...Hopefully, this quick question finds you well. Quick Question (and silly, too): For the Christmas Garden are completing a full cross stitch each time? I love the look of yours, but when I do it I can't tell the difference dramatic look. Good Morning, Nicole. I hope this email finds you with a little time to answer a quick question. I was wondering if you are completing one X stitch before moving on to the next stitch? I can't tell the difference when I do this with over dyed flosses, but your Christmas Garden is gorgeous and wondered what you do. Thanks. Enjoy your day. I couldn't email you directly because you didn't leave your email address. Have you tried leaving a comment on her blog?